This is the first book I have read by Amy Irvine, but now I’m a member of her fan club. I devoured Desert Cabal in just one sitting. Amy Irvine’s writing is so fluid and absorbing that I found myself turning pages quickly, so packed with description that I had to read some sentences more slowly in order to fully absorb them. Her honesty kept me engaged, and her wilderness experiences as a woman, with family, boyfriends, husbands, and finally by herself, may remind you of your own. She puts out there as an uncomfortable truth: the disconnect between activists and their lifestyle choices (including Abbey’s) at the same time that she acknowledges the complexity and paradox of humans and their needs. Her voice is the first of all those in environmental writings that I have identified with in a movement that is dominated by white men and men’s writing. Her lack of reverence for Edward Abbey, in the land of people who revere him as one of the Gods of the environmental movement, I found refreshing. 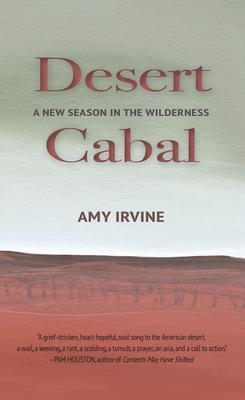 Thanks to Amy Irvine for the courage to write this at the 50th anniversary of Abbey’s Desert Solitaire as a critical, vital new generation of writing in the west.